Correct. Gentle inputs to the throttle and steering will minimise your chances of losing control. There are two options when this happens. If you have an old car, you should definitely avoid braking hard. The edge of the road is likely to have loose gravel, dirt, grass or another surface that's more slippery than the main carriageway. Older cars don't have the technology to distribute the braking force to the wheels that have the most grip so if you brake there's a chance the wheels on the edge of the carriageway will lock and then you will have much less steering control. If you have a new car that has Electronic Stability Control (sometimes called Electronic Stability Programme or Vehicle Stability Control, depending which manufacturer is offering it), and Emergency Brake-Force Distribution (EBD) then it is safer to brake harder if you need to because the braking force will be channelled to the wheels that have the grip. Simply steer where you want to go and if traction is lost, ESC and EBD will activate automatically to help you bring the car back onto the road. Manufacturers put information about ESP in their brochures. For example, this is from a Suzuki Swift Sport and explains how the system work. 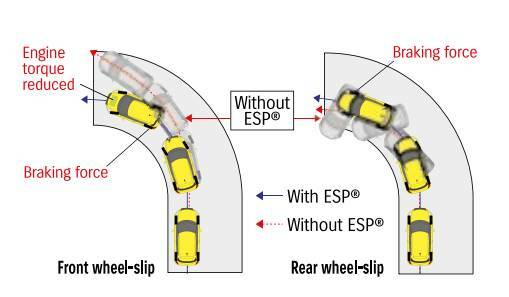 ESP will also work if you steer without braking and your car skids.